There are many good reasons for using ceiling wallpaper. 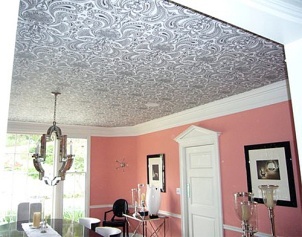 From covering up defects to high-lighting a focal point - the use of ceiling wallpaper as a design tool is endless! In the past, people have tended to overlook that there is a "fifth wall" in a room - the ceiling. But many of today's newest design trends are incorporating the use of wallpaper on the ceiling in new and exciting ways. Traditionally, wallpaper has been used to cover up cracks and defects on a surface that are hard to cover with paint. If your ceiling has uneven places then wallpaper can fix that problem by making it appear more smooth and even. With a more traditional use of ceiling wallpaper, ceilings are covered with the same wallpaper used to decorate the walls. 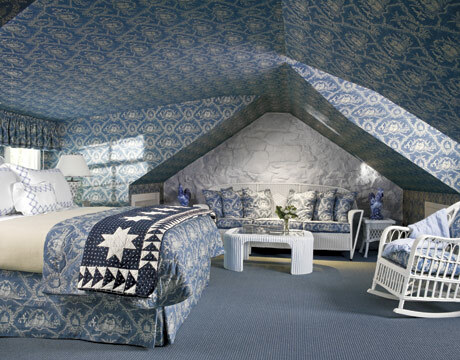 In this image taken from countryliving.com the low, irregular ceiling of this room was enveloped in blue-and-white wallpaper to give it the warm and inviting feeling of a country inn. The use of the same wallpaper on the ceiling as the walls helps to provide a seamless effect and creates a more intimate feeling in a room. In contrast, with a more "modern" approach to decorating, ceiling wallpaper can be used to highlight a focal point on the ceiling. Trends in architectural design have also been placing more emphasis on the importance of ceilings. In my experience, nearly any high end re-design or new build home now features focal points on the ceilings especially tray ceilings. 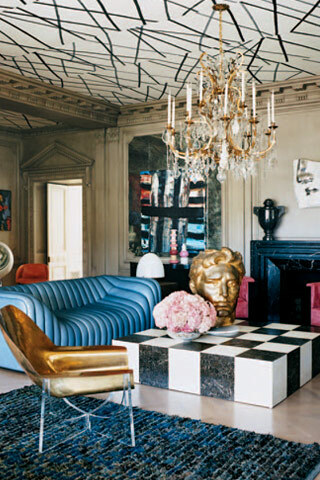 This image is taken from vogue.com and features the home of designer Kelly Wearstler: In the drawing room of the Beverly Hills house, a 19th-century chandelier hangs from the ceiling with Kelly Wearstler Custom Design paper by Porter Teleo. To high light these design elements, the use of metallic wallpaper has been a huge new trend and you can also find wallpaper that feels like leather, velvet, alligator skin, or stone. Papers that are also used as ceiling wallpaper includes the ever popular natural fibers like grasscloth and bamboos and even papers with glass beads or Swarovski crystals that look particularly striking on the ceiling. Of course, another way to feature the ceiling is by the use of a mural. 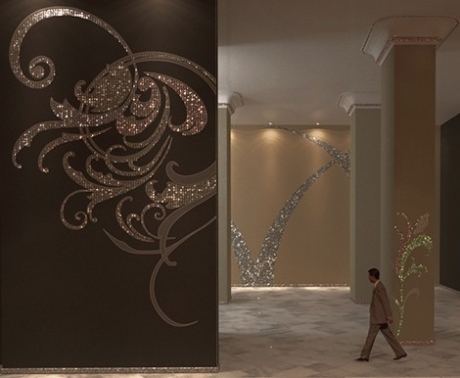 Instead of taking the time and expense to have a mural hand painted on your ceiling why not have the beautiful hand painted effect of TattooWall? Don't worry, Your e-mail address is totally secure.I promise to use it only to send you Hunter WallCoverings Newsletter.